Engagement is flat. Manager effectiveness is in trouble. After a taking a dive the previous year, employee engagement remains relatively flat, and to top it off, deficient performance feedback from managers is holding employees back from full engagement. Who’s getting hit the hardest? Where are the biggest declines and improvements? And how can you ensure these factors don’t negatively impact your workplace? 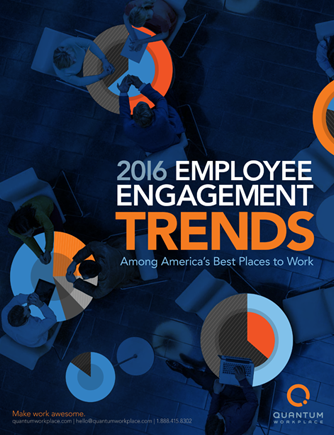 Find out these answers and more in the sixth annual Employee Engagement Trends Report, our most popular ebook! Discover the trends impacting today’s top workplaces in this comprehensive report, examining employee survey data from more than half a million employees across 8,700+ organizations competing in Best Places to Work. New this year! Men’s and women’s engagement has always been disparate, but what about those who don’t identify as male or female?